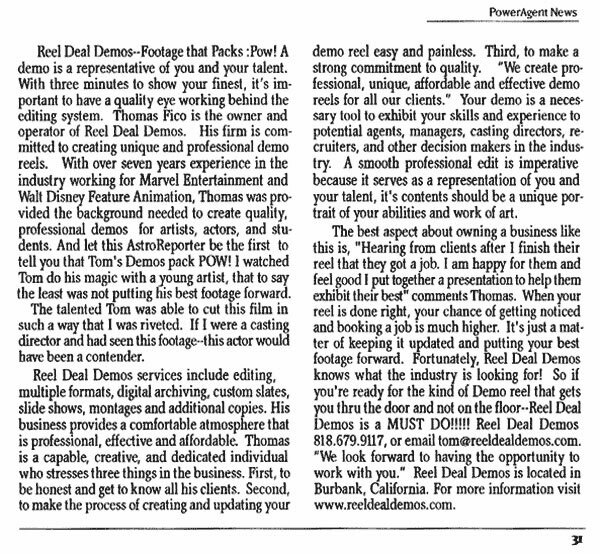 Reel Deal Demos is owned and operated by Thomas J. Fico (view Linkedin profile - Tom Fico). He started the business in 2003 and has a firm commitment to creating professional and unique reels. Thomas has been in the entertainment industry since 1995. Prior to owning his own business, Thomas worked for companies such as Marvel Entertainment and Walt Disney Feature Animation. His positions throughout the years with Disney provided him with the background needed for creating demo reels. He started in recruiting, which is where he learned how to judge artistic demo reels. His second position at Disney was as an Audio and Video Technician. It was this position that gave Thomas the technical background and skills needed to be proficient in all areas of video production. Thomas is capable, creative and dedicated to making each reel a professional presentation. He stresses three things in his business. First, to be honest with all clients. Second, to make the process of creating and updating your reel easy and painless. Third, a strong commitment to quality.